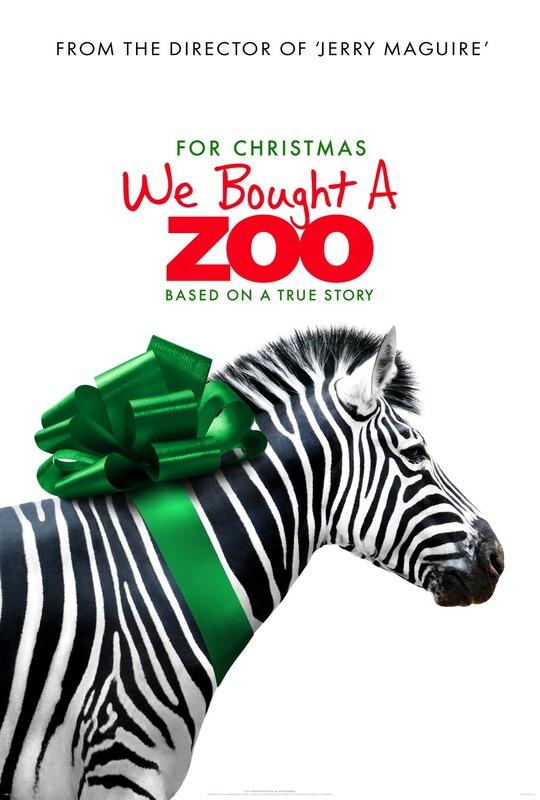 Eagerly ready for Christmas, We Bought A Zoo has wrapped us up a zebra in a big green bow in a new poster for Cameron Crowe‘s exotic animal-filled drama this week. From the director of Jerry Maguire, We Bought A Zoo is based on a memoir by Benjamin Mee about how he and his family – played by Matt Damon, Scarlett Johansson and Elle Fanning – used their life savings to buy Dartmoor Zoological Park in the English countryside. From seeing Matt Damon as a father figure in last month’s Contagion, I think we can expect something really moving from his portrayal in this heart-warming story. But We Bought A Zoo is also a comedy, so it will be interesting to see how he and Johanson work that in too. The film also stars Thomas Haden Church, Colin Ford, Patrick Fugit and the famous Crystal the Monkey, and is set to be released on 30th March, 2012, in the UK and 23rd December, 2011, in the US. Icelandic musician Jón Þór “Jónsi” Birgisson, frontman of Sigur Rós, will also be composing the film’s soundtrack – now that’s definitely something you want in your Christmas stocking.